Facebook’s new “Live” feature became widely available this spring, allowing users to host their own live broadcasts. For companies exhibiting at tradeshows, it’s worth exploring. You can take advantage of the visuals and activity around your booth to showcase new technologies or give a glimpse of how you’re engaging with other professionals on the road. 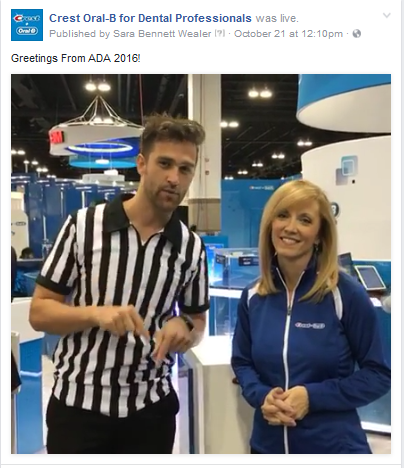 As part of our social media campaign for Crest and Oral-B at the American Dental Association annual meeting, MPG incorporated a Facebook Live broadcast that garnered the highest engagement of our social media activities at that event. Here are some tips you might find helpful if you’re considering Facebook Live at conventions. Test First – Convention halls vary in the quality of their wifi, and providing your own within your booth can get pricey. To make sure you’ll be able to do a good-quality broadcast from the show floor, conduct a test the day before around the same time and under the same conditions using a personal Facebook account. Watch Your Background – There’s an element of danger to going live: you never know what could happen. A wise guy making rude gestures in the background won’t reflect well on your brand. If you’re concerned there’s even a remote chance of that happening, then choose locations with a backdrop or that limit views of the crowd. Time It Right – Think about what time of day your audience is most likely to be on Facebook and schedule your live broadcast accordingly. Make sure you broadcast for a good length of time—at least 10 minutes—to give people time to discover and tune in. Don’t forget to give periodic reminders who you are and where you’re broadcasting from to bring those new viewers up to speed. Enjoy the Interaction – Facebook Live allows you to see comments and questions in real time, so don’t be afraid to engage with them. Try doing a Q&A with the viewers at home, or give a shout-out to specific fans. The live format is supposed to be fresh and spontaneous, so have fun with it — as much as your brand equity will allow. For more ideas on how to amplify your trade show activities using social media, check out our article on how to execute a fun and successful Facebook video campaign.